My perspective on the future of Chinese art in either the local or global context has been directly informed by my experience as a foreigner living in China, within the local context, for the last eleven years. The conclusions I will offer are thus drawn from the rather odd position of being non-Chinese, with unapologetically western values, yet pointedly with the complexities of the local situation in mind. On one hand, by being an outsider present in China and directly involved with its contemporary art circles, I have had an unobstructed insight into the challenges that have, and continue to face Chinese artists in the global context. On the other, this role of "foreign witness" afforded an unbiased position from which to appreciate the significance of what is happening locally, in China, now. The title of this symposium "Envisioning the Future of Contemporary Art from Different "Global" Positions" sets up a daunting proposition: the subject is huge and certainly demands a commensurate vision. To date, the evolution of contemporary Chinese art has been dogged by small, complex issues of both global and local origin that have exerted disproportionate impacts. Where it takes time for sleeping dogs to be let lie completely, what does the impact of these issues indicate for the future? To look at the future does first require an examination of the past. In terms of China, the past has been clearly divided between "global" and "local": the situation in one being a catalyst for activities and responses in the other. Here again, to look to the future demands an analysis of these variant environments. The intersecting, interaction and even repulsion between the "global" and the "local" has been chaotic. As time passes, it will of course diminish in importance. But that is the future, and we have first to consider how the past has resulted in the present climate. In regard of contemporary art from China, to date, the global and the local arenas could hardly be spoken of in the same breath. When the New Art Movement emerged in the mid 1980s, these arenas existed in opposition to each other, were diametrically opposed in many ways, and, at times, almost unreconcilable. Until very recently, this remained the case. Who, or what, is responsible and why? In regard of the big picture, the short answer is the China situation, specifically the socio-political history, against what that history, specifically the latter communist era, represented to the outside world. On a more microcosmic level, within the sphere of contemporary art in China, the stimuli and standards governing the New Art Movement and all it spawned were in turn governed by the ambitions and the goals that the artists chose to formulate for themselves. Where the local situation was culturally restrictive, these goals were much in line with perceived global agendas. Initially, through the 1980s as Deng Xiaoping's policy of opening and reform got underway, the primary goal was, to paraphrase Mao, to have the best of the West and be better. Artists felt this applied to art as much as any system of economics or social reform. It was a concern inherited by succeeding generations, which although might not subsequently be associated with a Maoist ideal, was certainly invoked to make China as culturally cool as any other first-world nation. The 1980s were bewildering times, full of uncontainable excitement and then, in 1989, a monumental depression. Yet, even though the moment in which the art world in China morphed into a movement came at the tail end of an era characterised by political division and limited cultural understanding, by the early 1990s, there was almost a rush of grand-scale "China" exhibitions abroad. Each proclaimed itself a comprehensive survey of developments to date and was presented in a manner that paralleled an anthropological discovery. As one journalist puts it, this approach was "… probably the way one can best disarm the unpredictable fantasies that people in any country may harbour concerning others speaking unknown languages and living thousands of miles away" . The "tail" end of this era proved to be very long: the journalist in question was, in fact, speaking of "Alors, La Chine?" 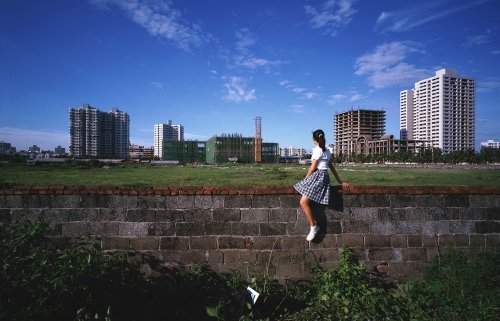 shown at the Pompidou Centre in 2003, which in launching the year of Frano-Sino cultural exchange was required to both disarm and give credence to the fantasies – or reservations – the local population might have about contemporary China. In the event, it merely highlighted how little these had unchanged from the previous decade. However, initially abroad, this approach was a necessary means of inciting global interest. On the whole, it was born of genuine interest too on the part of curators and host venues. The universal problem was how to broaden the curatorial interest by selling new Chinese art to the public. The assumed prejudices of China's political regime against the rapidly changing socio-economic advancement offered exactly the right kind of exotic allure. It is hard to imagine how interest in the art could have been captured and sustained so effectively without the especial nature of the local socio-political and economic situation in China: hence the diametric opposition – East/China against West/First World - which was invoked as so intriguing a conundrum. This symposium then, comes at an interesting moment. To have attempted a discussion of the future for contemporary art from China even five years ago would have revealed the limited nature of its existence in China and its global profile. First is that fact of the conference being held in China. We are here not only because of an exhibition, but to celebrate an exhibition of contemporary photography and video art: one that is taking place in the Shanghai Art Museum. It is also an opportunity to grasp just how different the work in the exhibition is from the approaches and styles which prevailed ten years ago, or even those which were present in the works created for the first show of video art, here in Hangzhou, at the National Academy in 1996. Although numerous independent events have been held in China since the mid 1980s, contemporary art only began to nudge the public consciousness in 2000, with the Third International Shanghai Biennale. To date, this art has been almost entirely nurtured and supported by a non-Chinese audience outside of China. This was not without its problems. But until recently, without serious opportunities to speak to a local audience in a culturally-specific local language, the work produced by China's avant-gardists was honed towards a global consciousness in form and vocabulary. This brings us to the first of those "small, complex issues" that have shaped attitudes and practices amongst China's avant-garde art community. As has been heard in recent years from numerous local critics, all too often this art was further accorded just enough oriental and/or political exotica to fulfill rather than to disarm all those unpredictable fantasies about China. The result is that where western critics were not convinced of the work’s individuality or style, critical discourse, so important for lending credibility to the work, to validating it for audiences and keeping it in the public consciousness, was restricted. A point I will come back to in a moment. First to take a more positive stance, today, with particular regard to the local context, the situation is quite different, and thus suggests great possibilities for the future. To discuss the future in regard of China, however, is abstract at best, and encourages circumspect projections the only tangible basis of which lies in the past and the present. As just indicated, the present is already far different from the kind of projections that could be made in the 1990s, but in looking to the future from the present, we are being asked to speculate on possible scenarios over which even the artists have limited control. Locally, much of the future’s brightness depends upon political and economic currents; more depends upon achieving broader levels of cultural education and awareness among the urban populaces. In the global context, the situation is complicated by the fact that interest has proved subject to trends and hype and, in terms of museums and the market, attendance figures and profit margins. Each of these elements will affect the future for Chinese art outside China. Even so, given the enormous changes that have taken place within China through the last decade, and the equally significant changes in western attitudes towards China, then surely, at least for the time being, we can anticipate the future for China’s contemporary art to be very bright indeed, especially the future of the art locally, in China. Logically, in boosting local confidence, the fact of a vibrant local scene should also serve to bolster and sustain the future globally, and foster a profounder aesthetic engagement, as we are already beginning to see. Increasingly, from the late 1990s, there has been a move away from the emphasis upon "China" as a theme. Increasingly, curators are looking to what individual artists offer in terms of personal expression and aesthetics, and how these contribute to international shows that ostensibly bring together the voices of varying "locales" to explore "global" issues. More recently, in terms of the State, we are beginning to see the slack in the cultural sphere that was allowed to form through the Deng era being taken up by the introduction of real hardware. New art schools are being built, museums are being refurbished, the government is providing some degree of support and, more importantly, demonstrating a quiet awareness where it counts – at the top – that culture is vital to the credibility China wishes to attain as a holistic nation amongst the leading global powers. Here, the quality of the future is inalienably tied to the experience that is being accrued now, and how that feeds into an appropriate local system and infrastructure. A number of foundations have already been laid: biennials in Shanghai, Chengdu and Beijing; a major public art biennial in Shenzhen; a triennial in Guangzhou. All these cities now own independent art spaces and a number of commercial galleries that operate within greater and lesser spheres of influence and success. Increased media coverage across a range of magazines, published in the big cities, is also encouraging a flourishing proletarian audience interest, per force contained within small pockets of urban society. In addition, urban residential architectural projects like Soho New Town in Beijing are taking works of art by contemporary artists into the public arena. Contemporary art, thus, has the beginning of a tangible profile within the current cultural framework in China. When compared with the public face of ten years ago, the significance of this should not be underestimated. So, to return to the future for a moment, my initial conclusion was simple: contemporary Chinese art is assured a future by virtue of the good future that seems certain for China in the wake of its continued economic development and deepening reforms. This brings us back to the issue of global and local, and the rift between the two, if for no other reason than because it still exists. Yes, it will diminish with time, but parties on both sides of the East-West divide need to consciously re-examine their thinking if they are going to make it go away entirely. We know that this "rift" owes its origins to the local political context and certain historical hegemony on the part of the global community. Let's take a specific example: Through the twenty years since 1985, when the New Art Movement began, the China-outside world situation encouraged contemporary artists to take on an enormous range of ideas from the West. If discussing this process from a western perspective about western artists nothing could be more natural than for artists of each new generation to devour, absorb, dissect and reinterpret what has gone before. In broad terms this is exactly what the Chinese avant-garde did. The results proved enormously successful - like those of the Political Pop school and the Cynical Realists. It is interesting to note that there was little interest in styles of art that seemed to come too close to those established by western artists. Here, by example, Zhang Xiaogang's early Expressionist / magic realism work is almost unknown, whilst his "Big Family" paintings have subsequently become the most recognised motifs of contemporary art from China. Such were the aesthetic dilemmas that recognition and, importantly, commercial success abroad mitigated. But as China changes apace, so has the style and content of the art being produced. As suggested previously, outside of the acceptance awarded to a handful of individual bodies of work from China, international critical acclaim still clings fast to reservations as to the originality and authenticity of the work. Within the global context, contemporary art from China still contends with a number of non-art issues that if not addressed – or laid to rest - set the future in a delicate balance. The first is to challenge received impressions of China. Initial interest in contemporary art from China clearly had political overtones. It was fed by the political conflict that was injured in the Cold War, and its conclusion: in simple terms, bye-bye Red Square, hello Tiananmen. The insistent facts of political events and the interpretations of them served to inform cultural outlooks: why else was the cause of the Chinese avant-garde embraced with such enthusiasm by the US media, making the cover of the New York Times, and several issues of Time magazine and Newsweek? when all US artists know how difficult it is to be featured in such mass market publications. With human rights on the agenda, Chinese artists were seized upon as the obvious champions of the individual and freedom of expression. This was a separate issue to "selling" the art as an exhibit to audiences. One example is demonstrated by the headlines accorded Andrew Solomon's 1992 article in the New York Times magazine: On the cover was what is now Fang Lijun's most recognised painting - largely due to the publicity it garnered courtesy of the New York Times magazine. Ascribed to the image was the line: The Howl that Could Free China. It is one of many instances where the art was applied to politicised ends, clearly intended to manipulate the impression of China politically that readers took away with them. A howl of presumed pain, issued forth by these artists, and yet even the editor could not ignore the fact that this "howl" was a yawn: a fact that was noted as a tongue-in-cheek aside. This of itself might be easily forgiven as an efficient means of grabbing reader attention, but the article was titled: Their Irony, Humor (and Art) Can Save China. The word art, being bracketed, was clearly relegated to the status of an aside. I make this point not as a criticism –an act of naive petulance given the benefit that such publicity engendered overall - but to illustrate a situation as it pertains to Chinese artists attempting to engage with the West. It was exactly this kind of reporting that prompted the artists to adopt a deliberate "playing the West at its own game" strategy in making art: drawn into a game of political posturing that was more about restoring national pride than producing good art. And this wariness in foreign attitudes towards "Chinese avant-garde" artists is not a thing of the past: The frustration it inflicts was reaffirmed recently when Wang Jianwei returned to China following a six-week residency in the US. For every one question he was asked about his work, twenty were posed in regard of the political situation in China, of freedom, repression and censorship. This illustrates that which western audiences have been encouraged to extract from an engagement with Chinese art. In broader terms, it invokes the question of the role art is there to serve: An interesting study would be to ask local artists, curators, museum directors, gallerists and the public-at-large what purpose they believe art serves. Especially artists: Why they make art and who they believe should see it. Is it an expression of national heritage and patriotic alliance? Or simply creative expression informed by a cultural framework but that does not seek or need to illustrate that situation? This issue is particularly relevant as China builds a system for art within the local cultural framework where one did not exist before. Naturally, and unavoidably to date, much of the thinking about this has taken its lead from the West, but does that mean that the western system can be suitably applied to the China situation? The answer is that it does not. Here, at a challenging juncture within the western system as time-honoured institutions struggle to adapt to the new formats and mediums of contemporary art, China actually has an opportunity to circumvent the immovable structure of "the museum" and its burden of historical role in public life, and create a cultural intermediary relevant to the immediate local context. There will always be a role for a museum as a repository of art, but in a society that lacks the funding to achieve multiple significant collections, there is a justification for rethinking the approach. All these issues are paradoxical. There is no right answer and no road map that might be followed to arrive at one. That should be the most exciting part about the entire future. Rem Koolhaas recently said: "The future of China is the most compelling conundrum; its outcome affects all of us, a position of resistance seems somehow ornamental …" Ornamental is an interesting choice of word. It points to historical contingencies and manages to suggest that "a position of resistance" indeed says more about naivete of the external global arena concerning the local world of China, and where its future significance lies. This throws up a big challenge to Chinese artists in terms of their "glocal" future. On one hand, as China shrugs off its mantle of Cold War opponent and moves towards becoming a major power, the art has been able to effect a distance from politics per se, which overshadowed perceptions of it in the early 1990s. On the other, the diminishing of "China" as its own self-contained and –explanatory cache is being replaced by the growing need for compelling art that goes beyond superficial self-referencing, and extols deeper, more fundamental human issues: local context made global. The second point of significance, therefore, is for artists to place more emphasis and energy on their own personal agendas, without any thought to context other than their own. In recent years, artists of both the early and younger generations have grown up in a more liberal atmosphere, have demonstrated that they have a lot to say, and about their own situation. Interestingly, as they have done so, the bulk of the China iconography, the Chinoiserie, has receded from the art. But, in this regard, the change in timbre of the interpretations of contemporary Chinese art abroad is proving a double-edged sword. Without the "Chinese" motifs a large segment of the foreign audience finds it difficult to locate some of the better examples of contemporary art from China within the context of a current Mainland culture or cultural scene, or to perceive it as being distinctive from their own. Where audiences can't "read" the linguistic vernacular, accusations of imitation arise. Going back and forth over possible future scenarios, long term as much as short term, global, but particularly local, it is clear that any discussion about the future is only really served by exploring the needs of the local community now, and the best means via which to address them. On the whole, China's recent prosperity has been good for contemporary Chinese art. In practical terms, it has. Yet the initial impetus among the artists to create in a "contemporary" fashion did not arise within prosperous circumstances. In fact, when the New Art Movement emerged in the mid 1980s, the economic circumstances of China's avant-garde artists were nothing less than dire. This did not prevent the leading artists of the New Art Movement from producing substantial and enduring works under the idealistic banner of "art for art's sake" and wrestling with enormously complex - and often unresolvable issues. In the 1990s, against the tide of foreign interest, many Chinese artists saw their impoverished circumstances inverted beyond their wildest expectations. Naturally, prosperity was of enormous benefit to all concerned, for it was instrumental in sustaining the artists' practice when they and their art went unacknowledged in their locality. But now we can see the benefits of local economic growth on the art scene and the system in general, does this mean that a good economy is good for the future of Chinese art? Money certainly greases the wheels of society; opening and reform and economic development have oiled cultural awareness. But when all flows so smoothly, where do artists go to get an edge in their work? One only has to look to BritArt to witness the effects of too much prosperity, business and hype on creative innovation. This is particularly relevant to China where so many younger artists have, in recent years, taken their lead from Damien Hirst, Tracy Emin etc. Increasingly, the ways in which Chinese artists choose to express themselves do not always conform to the structure and vocabulary of western constructs. If Chinese art is to have its own tangible future, then artists should not feel coerced into conformity. Equally, vacuous, shocking or superficial dalliances with western models and "China" motifs should be written off as extravagant or frivolous distractions. Especially where they do not further human experience, in a global or local sense, or challenge the emotions, rational thoughts, and general experience we have of the world in whatever small or seemingly insignificant a way. So what is the right balance? Artists previously dedicated so many years to the global environment, but now it is the local context that currently has more allure, and possibilities. What shape is the local cultural framework in now to act as a seedbed for the future? Certainly in the wake of reform and opening, in recent years, "now" has offered artists a rich array of seductive subjects and topics: socio-political change; consumerism; consumption; indulgence; sexual roles and identity; corruption; youth culture; status and personal space. If artists are truly exploring such subjects in relation to China, their art should speak clearest to a local audience? As foreign people come to know more about China, this art will certainly speak to them too, just as western art has "spoken" to local Chinese artists. Globally, Chinese art excites because China excites: there are few more exciting places in the world than Hong Kong yet creatively its artists struggle to maintain a dialogue with the international art world, a dialogue which came to China’s contemporary artists so effortlessly. But this is not something artists can afford to be complacent about. The question is how to address this intelligently? How to go beyond the constraints of verbal language, beyond East-West, Trend-Fashion? With a pressing need for open dialogue and communication, much of the future depends upon the agendas that are set now, today. Previously I suggested that artists have little control over that future. In broad global and local terms they don't, but they do have a monopoly over the type of work they create. When they have got that right, no one will ever have reason to put brackets around their art again. The question of the future, global or local, really hinges on how they proceed, to what ends and on whose terms? Perhaps, by putting the past behind them and focusing their energies on building upon what is plausibly the most dynamic present position any "glocal" context we could name.